Use of acupuncture has widely increased in patients with chronic low back pain. However, the evidence supporting its efficacy remains unclear. In this article, we report the design and the protocol of a multi-center randomized sham-controlled trial to treat chronic low back pain. Our goal is to verify the effect of acupuncture on chronic low back pain. This study is a multi-center randomized sham-controlled trial with 2 parallel arms. Participants included in the study met the following criteria: 1) low back pain lasting for at least the last 3 months, 2) a documented ≥ 5 points on a 10 cm visual analog scale for bothersomeness of low back pain at the time of screening and 3) between 18 and 65 years of age. Participants were blinded to the real and sham acupuncture treatments. The real acupuncture treatment group received real acupuncture 2 times a week, during a total of 12 sessions over 6 weeks. The control group received sham acupuncture during the same period. In order to assess the primary and secondary outcome measures, the participants were asked to fill out a questionnaire at the baseline and 6, 8, 12 and 24 weeks after starting the treatments. The primary outcome was measured using the visual analog scale for bothersomeness of low back pain at 8 weeks after the initiation of treatments. The result of this trial (which will be available in 2010) will demonstrate the efficacy of using acupuncture to treat chronic low back pain. Chronic low back pain (LBP) is one of the most important public health problems, as well as one of the main causes of disability among adults of working age . More than 50% of adults are bothered by back pain each year and over 70% of adults have suffered from back pain at some time in their lives [2, 3]. Although a wide range of standard treatments are available , back pain patients are often dissatisfied with conventional medical care . Acupuncture is one of the frequently used methods in patients with low back pain . Especially in Korea, where acupuncture has a much longer tradition than in other countries, low back pain is the first reason that people consult with the Korean Medicine Doctor (KMD) for acupuncture treatment . A number of randomized controlled trials (RCTs) on acupuncture for LBP have already been published [8, 9]. However, conclusions regarding the efficacy and effectiveness of acupuncture for this common problem remains contradictory [8, 9]. Most of these equivocal results are due to low methodological quality, small sample size, and other factors such as inherent difficulties in the use of controls [8–10]. Acupuncture is complicated to evaluate because it is difficult to isolate the characteristic or specific effects of the technique from the non-specific ones . Some reviews have noted the poor quality of research in this area and have insisted on scientifically rigorous studies [8–10]. In this paper, we propose a randomized, sham-controlled study of patients with chronic low back pain, with a predetermined sample size and appropriate follow-up, which will enable us to investigate the efficacy of acupuncture on chronic low back pain. This study is a multicenter, randomized, non-penetrating sham-controlled study. The trial was conducted in the following three hospitals after obtaining permission from the Institutional Review Boards of three institutions: East-West Neo Medical Center of Kyung Hee University, Oriental Medicine Hospital of Sang Ji University, and Kyung Won Incheon Oriental Medicine Hospital. The patients were blinded to group allocation. The outcome assessment and the statistical analysis were performed by professionals who were blinded to the assignment of patients to either real or sham acupuncture (Figure 1). Study sequence; Process of recruitment, randomization to treatment, and outcome assessment. Patients aged between 18 and 65 years with non-radicular chronic low back pain of mechanical origin were recruited. Inclusion criteria were developed mainly to exclude patients with specific or complicated low back pain. Participants were recruited through advertisements in local newspapers, the hospital monthly magazine, on a website and on bulletin boards. If patients were interested in participating, they were asked to answer questions to determine eligibility. If eligible, they were guided through the informed consent process. After written consent was obtained, a study researcher administered the baseline questionnaire followed by random allocation to either the real or sham acupuncture group. After randomization, the interviewer scheduled the treatment procedure. 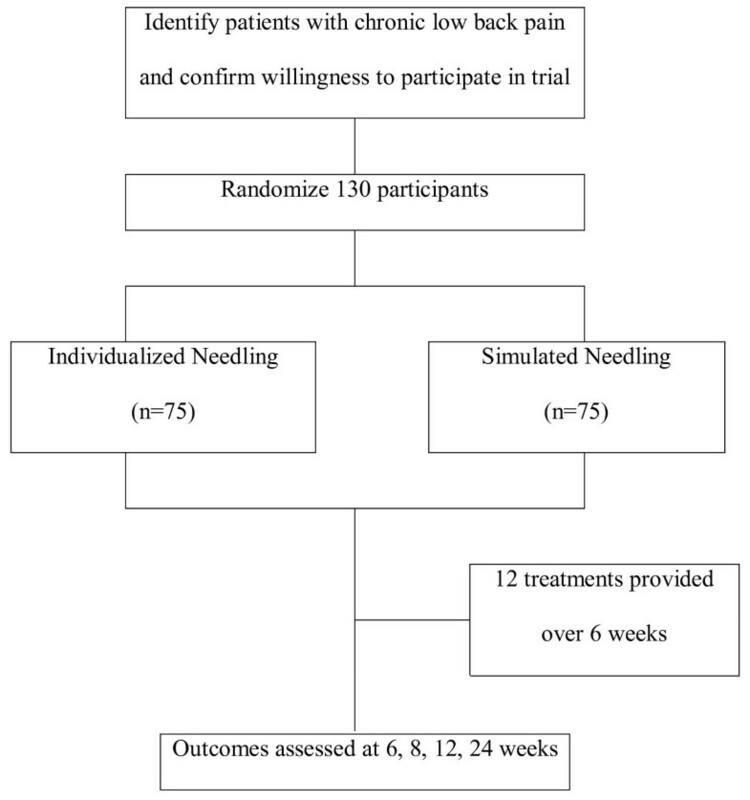 The patients were randomized per center in order to give each investigator the same chance to use individual, standard, and sham acupuncture to control the selection bias of the trial. The random code for randomization was generated by the medical statistician and was kept by a clinician who did not contact patients. Randomization was performed only after a subject was confirmed to be eligible and written informed consent was obtained. Subject details were recorded and a treatment arm and randomization number were allocated to the subject, and both of these were recorded in the subject's hospital file. The randomization form will be completed and returned to the principal investigator. In order to ensure balance within the two groups, blocked randomization was employed. This was made possible by using computer-generated random numbers from SAS software or other computer software. Different block sizes can be used. For a block of four, the possible assignment orders are AABB, ABAB, ABBA, etc. If there is an important predictor of outcome, stratified block randomization is available. For example, gender may be a strong predictor, and then block randomization within each of the two strata, male and female can be performed. The blinding credibility of the real and sham acupuncture treatments were evaluated at the baseline and at the end of the 6-week treatment. Licensed Korean Medicine Doctors (KMDs) who specialize in Korean Rehabilitation Medicine from the three participating hospitals should take the educational course to strictly adhere to the study protocol and to be familiar with administering study treatments; all participating KMDs underwent intensive and customized training for a full understanding of the "sham acupuncture" procedure, including details such as acupuncture points, depth, and manipulation. They were also trained to administer real acupuncture using a sham needle device. Both real and sham acupuncture groups received a total of 10-12 acupuncture sessions (approximately two times a week, for 6 weeks). In the real acupuncture group, disposable sterile needles (40 mm × 0.25 mm) were used (Dong-bang Acupuncture Inc., Seoul, Korea), while non-penetrating sham needles with identical gauge were used in the sham control group (Acuprime Co., Ltd, UK). At the time of the first acupuncture session, all participants received an "exercise manual for low back pain patients" from the spine center of East-West Neo Medical Center of Kyung Hee University and were encouraged to do exercises according to the manual during the whole treatment period. This manual includes information on physical activity, exercise and appropriate life-style modification. A pre-defined, individualized acupuncture prescription in accordance with the characteristics of pain was employed. For this study, we developed a flexible treatment protocol by selecting a group of points that were predefined in every case, allowing the participating KMD some flexibility in the choice according to the diagnosis. The predefined points were carefully selected by a process of consensus with participating KMDs who were all experienced in low back pain. When we treated the patients in this research, we chose acupuncture points after the process of the meridian pattern identification. To treat low back pain, we assumed 3 types of meridian pattern identification according to the pain location (A: Gallbladder meridian pattern, B: Bladder meridian pattern, C: Mixed pattern). The acupuncture points included: Shenshu (BL23), Qihaishu (BL24), Dachangshu (BL25), Yimmen (BL37), Weizhong (BL40), Wangu (GB12), Daimai (GB26), Huantiao (GB30), Yanglingquan (GB34), Zulinqi (GB41), Dicang (ST4), Zusanli (ST36), Fushe (SP13), Fujie (SP14), Yaoyangguan (GV3), Mingmen (GV4), Xuanshu (GV5), Shenting (GV24) and Shuigou (GV26). Acupuncture treatment was given using a sterile, disposable stainless steel needle (40 mm × 0.25 mm) with the aid of the tube of a sham acupuncture needle device. After the skin sterilization, the needles were inserted perpendicular to a depth of 5-20 mm with the patient lying down and blindfolded, followed by bidirectional rotation to induce Deqi sensation. The needles were left in place for 15-20 minutes. As the real acupuncture group received treatment that reflects everyday practice, the acupuncture points were varied from visit to visit when the symptoms or pain changed. Non-penetrating sham needles by Park et al. (Acuprime Co., Ltd, UK) were used. Eight pre-defined points in the lower back, which are non-traditional acupuncture points, were used after skin sterilization, with patients lying down; 1 cm below from Weiyang (BL39), 1 cm lateral to Ganshu (BL18), 1 cm lateral to Pishu (BL20), and 2 cm above from Huantiao (GB30), all bilaterally. The technique did not vary in any way from that performed in the real acupuncture group, except for the usage of a semi-blunted needle. The sham needles were left in for 15-20 minutes of the session, as was done in the real acupuncture group. Patient completed a series of measurements to assess back pain-related dysfunction, pain, quality of life, and back pain-related costs. At the screening visit, patients were asked to fill out a questionnaire regarding age, gender, marital status, residence, occupation, and education. Medical history was also taken before physical check-ups and it was determined whether the patient would be included or not. The baseline (T0), 4 (T1), 6 (T2), 8 (T3), 12 (T4), and 24 (T5) week follow-up measurements are summarized in Table 1. *, At every single visit; †, After 1st treatment and at the end of treatment (6-week); §, 10 randomly chosen participants (5 from acupuncture group and 5 from sham group) for each hospital, thus 30 in total. The primary outcome was measured using the visual analogue scale (VAS) for bothersomeness of low back pain. Since our intension was not to simply evaluate the severity of pain, but also to understand the impact of chronic low back pain on the patients' life, we used the VAS not for pain intensity, but for bothersomeness of low back pain, as a primary outcome measurement. The patient was asked to mark, on a 10-cm VAS (0, absence of bothersomeness; 10, the worst bothersomeness imaginable), the degree of bothersomeness due to low back pain experienced within the most recent one week from the day the assessment was performed. This measurement has substantial validity; it is highly correlated with measures of function and other outcome measures. Bothersomeness of low back pain was measured at baseline, and on the 4, 6, 8, 12, and 24-week follow-ups. The primary endpoint was the 8 week follow-up, i.e. 2 weeks after completion of the 10-12 sessions of acupuncture treatment. There is ample evidence supporting the validity of the visual analogue scale (VAS) for pain intensity. Many studies have demonstrated the validity of its construct and its reliability [14, 15]. This is a fast and straightforward method for evaluating the subjective intensity of pain. Pain intensity was measured in the same fashion as VAS for bothersomeness (0, absence of pain; 10, the worst pain imaginable) at baseline, 4, 6, 8, 12 and 24 weeks after beginning of treatment. The Oswestry Disability Index (ODI)  was used to measure back pain-related dysfunction. ODI includes 10 questions about daily activities including pain intensity, personal care, lifting, walking, sitting, standing, sleeping, sexual life, social life, and traveling. Each question is rated on a 0 to 5 point scale and the lower the score, the less disabled. It takes 5 minutes to complete and the validated Korean version of ODI  was administered at baseline, 6, 8, 12, and 24-week follow-ups. Health-related quality of life was measured at baseline, and at 6, 8, 12, and 24-week follow-ups, using the well-validated SF-36 , which has been recommended for back pain studies. The SF-36 measures 8 health domains: 1) limitations in physical activity because of health problem; 2) limitations in social activities because of physical or emotional problem; 3) limitations in usual role activities because of physical health problems; 4) bodily pain; 5) general mental health (psychological distress and well-being); 6) limitations in usual activities because of emotional problems; 7) vitality (energy and fatigue); and 8) general health perceptions. The higher score means better general health status. In our study, the validated Korean version of SF-36  was analyzed. Patients completed the EuroQol 5-Dimension (EQ-5D)  at baseline, and at the 6, 8, 12 and 24-week follow-ups. EQ-5D is a generic questionnaire that measures the quality of life regarding personal health. It consists of two parts: in the first part, the patient evaluates in a descriptive way his/her health state, with respect to 5 dimensions, namely mobility, personal care, daily activities, pain/discomfort and anxiety/depression. Each dimension is scored from one to three, and so the best possible health profile is 11111 and the worst is 33333. In the second part, the patient rates on a VAS from 0, the worst imaginable state of health to 100, the best imaginable state of health, his/her overall state of health on the day the questionnaire is completed. The two scores are complementary. EQ-5D has an index of reference value of possible health profiles ranging from a value of one (the best state of health) to zero (death). Thus, we sought to combine these results with the years of life in order to calculate the years of life adjusted for health-related quality of life. Using this approach, as well as analyzing cost-effectiveness, we performed a cost-utility analysis. A validated Korean version of EQ-5D  was administered in this study. The Korean version of Beck's Depression Inventory (BDI)  is a 21-item self-administered questionnaire. It provides a quantitative measure of depressive symptoms. Each item has a 0-3 response format, giving a theoretical maximum score of 63. The following cut-off scores are recommended: scores 0-9 little, if any, depression, 10-18 mild depression, 19-29 moderate depression, and 30-63 severe depression. The psychometric quality of the questionnaire is very good . The validated Korean version of the credibility test, which was first proposed by Vincent , was used to assess the credibility of real and sham acupuncture treatments at the end of the 6-week treatment. The patients rated the credibility of the treatment they were given by answering 4 questions on a numeric rating scale, with 0 for not at all and 6 for maximal agreement: 1) improvement expected; 2) recommendation to others; 3) treatment logical; and 4) effective also for other diseases. Any adverse experiences at any clinic visit during the 12 sessions were monitored. The research team monitored serious adverse experiences, which were defined as treatment-related experiences. The trial would have been stopped if the principle investigator believed there was an unacceptable risk of serious adverse events in one of more of the treatment arms. Generally, a level of significance of α = 0.05 and a power of 1-ß = 0.80 were used. For two arms (control - sham acupuncture, experimental - real acupuncture), we considered the two sample t-test model. For the equal allocation for the two groups, total sample size considering drop-out rate of 20% was calculated as 130 subjects. All statistical analysis was performed in the principle of ITT analysis (Intention-To-Treat analysis) and PP analysis (Per-Protocol analysis). In the case of ITT analysis, we applied the LOCF (Last Observation Carried Forward Analysis) rule. For all statistical analysis, SPSS Win. Ver.14.0 and a significance level of 0.05 were used. For the description of baseline characteristics, both demographical and clinical, for all subjects in the clinical trial, the mean with standard deviation, range with minimum and maximum for quantitative data and frequency with percentage for qualitative data are described. For the homogeneity test of the baseline characteristics, both demographical and clinical, between the two groups, two-sample t-test for quantitative data and Chi-square test for qualitative data were performed. If there were baseline characteristics showing statistical significance and possibility of covariance, ANCOVA (analysis of covariance) was used for analysis and adjustment of baseline characteristics. The two-sample T-test was used for VAS for bothersomeness of low back pain at baseline and at 8 weeks for the comparison of the two groups and to determine differences from baseline. ANCOVA and two-sample T-test was used between the differences at baseline VAS and 8 week VAS for each groups. Also, a 95% confidence interval was added for all analyses. Repeated measure two factor analysis will be used to analyze the difference and mean change among baseline, and 4, 6, 8, 12 and 24-week VAS, difference and mean change between groups, and interaction between groups and observed time. If necessary, a mixed model approach was also used. For the variable, VAS for pain intensity, Oswestry Disability Index (ODI), SF-36, EQ-5D, repeated measure two factor analysis was used to analyze the difference and mean change among baseline, 4, 6, 8, 12 and 24-week VAS, difference and mean change between groups, and interaction between groups and observed time. If necessary, a mixed model approach was also used. For medication use, the Chi-square test was used to analyze the different types of drugs between the groups, dose of drug and frequency of dose in a day among baseline, 4, 6, 8, 12 and 24-week VAS. Repeated measure two factor analysis was used to analyze the difference and mean change between groups, interaction between groups and observed time. If necessary, a mixed model approach was also used. All adverse effects were recorded and described as frequency and percentage. For the comparison of adverse effects between groups, the Chi-square test or Fisher's exact test were performed. Investigators entered the information required by the protocol into the Case Report Forms (CRFs). Non-obvious errors or omissions were entered into data query forms, which were returned to the investigational site for resolution. The data from all centers were gathered and summarized with respect to demographic baseline characteristics, effectiveness and safety observations. We adopted the visual analogue scale for bothersomeness (not pain) as the primary outcome measurement. This is because the target disease of this study is chronic low back pain. According to the clinical experience, we observed that some patients with chronic pain tend to be very bothered by even a small amount of pain and others are not bothered by even moderate pain. In clinical practice, we frequently find it is more essential and effective to try to improve bothersomeness due to chronic pain than to try to reduce that pain itself. Various randomized clinical trials that have investigated the efficacy of acupuncture tend to use different types of control groups, such as sham acupuncture, placebo acupuncture and a waiting list [8, 9, 26, 27]. In this study, we chose placebo acupuncture (non acupuncture points) combined with sham acupuncture device. We believe that it is more valid to combine placebo acupuncture with sham acupuncture as the control group, in order to isolate the specific effects of the technique from the non-specific analgesic ones. This study is supported by Korea Health Industry Development Institute B080048.